The rich and varied evocation of passing moments, memories, and dreams that we encounter in Ming Smith’s photographs are things that the incoming President will continue to denigrate and do his best to erase. Ming Smith was the first woman — and for a long time the only on — to join the Kamoinge Workshop, a group of fifteen black photographers founded in 1963, in the midst of the Civil Rights movement and the beginning of a convulsive period in American history. 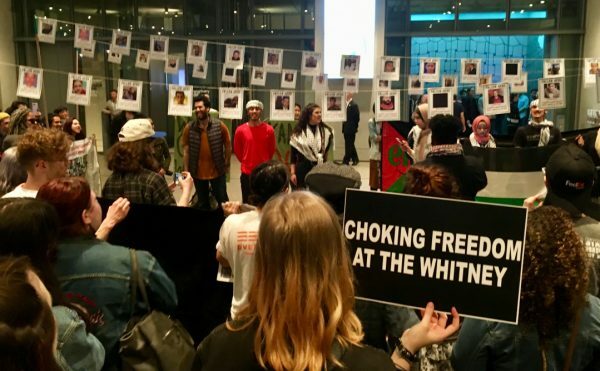 One impetus for the group was self-determination: the fifteen members wanted to document black life, as well as push back against the limited racial views that had been propagated by white photographers. The first director was Roy DeCarava, who characterized the photographs taken by members as “creative objectives [which] reflect a concern for truth about the world, about society, about themselves.” The strongest members of the group turned documentary photography into art. While Smith took black-and-white photographs of her changing milieu — New York neighborhoods, including Harlem; jazz musicians; her trips to Europe and Africa — her work is closer to dreams and memories than to The Decisive Moment (1952) of Henri Cartier-Bresson, which does not mean she did not do that as well, because she did (and she once made a portrait of Cartier-Bresson). In her hands, the documentary becomes about time slipping past, rather than the frozen moment. 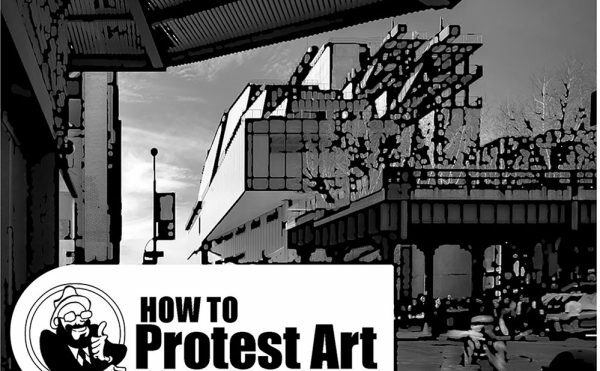 Previously, I have written about two members of the Kamoinge Workshop, Louis Draper and Anthony Barboza, for Hyperallergic Weekend. There is a wonderful book, Timeless: Photographs by Kamoinge (2015), edited by Anthony Barboza and Herb Robinson, coedited by Vincent Alabiso, with a Foreword by Quincy Troupe, which I have called “an essential document to the history of American photography.” Smith is both a part of this history — which still needs to be addressed — and a singular figure. The gallery press release for the exhibition Ming Smith at Steven Kasher Gallery bills it as “the first major retrospective of the photographer’s work.” There are more than 75 vintage black-and-white prints in the exhibition. A smaller retrospective survey of 33 photographs, Ming Smith Photographs: 1977 – 2010, was held at the June Kelly Gallery in 2010. Aside from their size, the big difference between the two exhibitions is that the current one focuses on her black-and-white photographs, and does not include any of her hand-painted photographs. In her use of blurred images, and the push from the documentary to abstraction through an emphasis on light and shadow, Smith comes across as one who knows the rules but refuses to play by them. This might require some viewers adjust to Smith’s vision of the world, which is not like other street photographers who began working in black-and-white photography during the 1970s, but it is definitely worth it. There are so many memorable works in this show, I wish a comprehensive monograph existed on Smith’s work — say 200 images to show the diversity of what she has achieved. 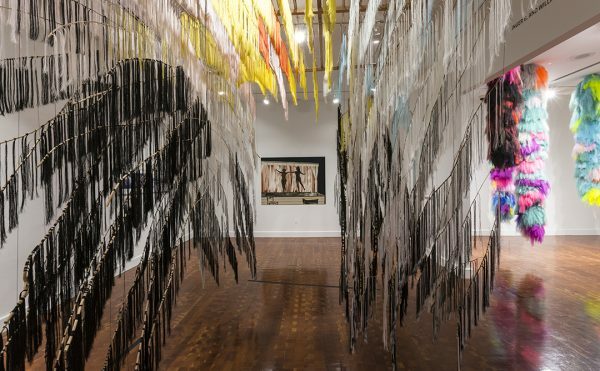 It is certainly time: if the history of what Americans know about themselves and art is going to change — and it damn well better — Smith’s work is part of that process. 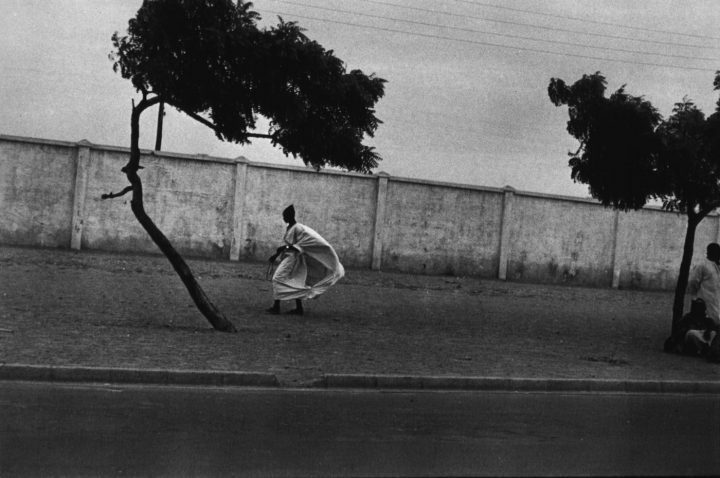 In “Dakar roadside with figures” (Dakar, Senegal, 1972), a woman is walking down the street — from right to left — into a strong wind, and a white cape-like fabric, which is attached to the hem of her white dress and shoulders, billows out behind her, like a sail. A gray wall forming her backdrop spans the length of the photograph, tilting from the photograph’s left edge to its right. The swollen bend of the tree trunk in front of the woman extends to the left, mirroring the swell of the cape, which is arcing to the right, while the leafy crown of the tree reaches over the woman’s head. On the photograph’s far right, two men are under a similar tree, which is perfectly vertical: it is as if there are two weather zones, with the wind between the trees and calmer climes on the rightmost edge. The angle of the wall, the echo of the woman and the tree, and the sense that there are two different weather patterns, are just part of what makes this photograph — its decisive moment — so enchanting. Everything is in tension with everything else; an active moment has been preserved, and the woman has been imbued with sculptural presence. She is a distinct part of this world, and she is in some sense separate from it, the lone citizen of her domain. 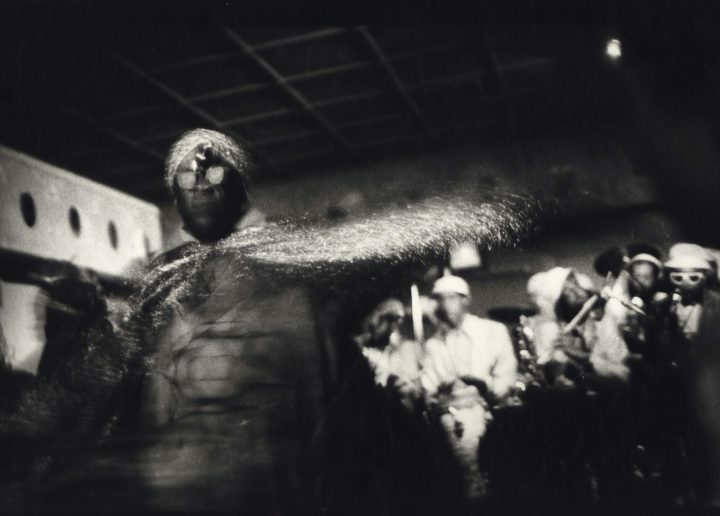 In another photograph, “Sun Ra space II” (New York City, New York, 1978, printed ca. 2000), Ra’s glittering headgear and scintillating scarf fluttering into the air look like something otherworldly and cosmic. Members of Ra’s band are behind him, playing as they follow their leader. Instead of focusing on Ra, Smith has keyed the photograph to the light as it struck the scarf, which is perfectly situated to become the center of attention. It’s as if Ra has transcended his corporeal presence. 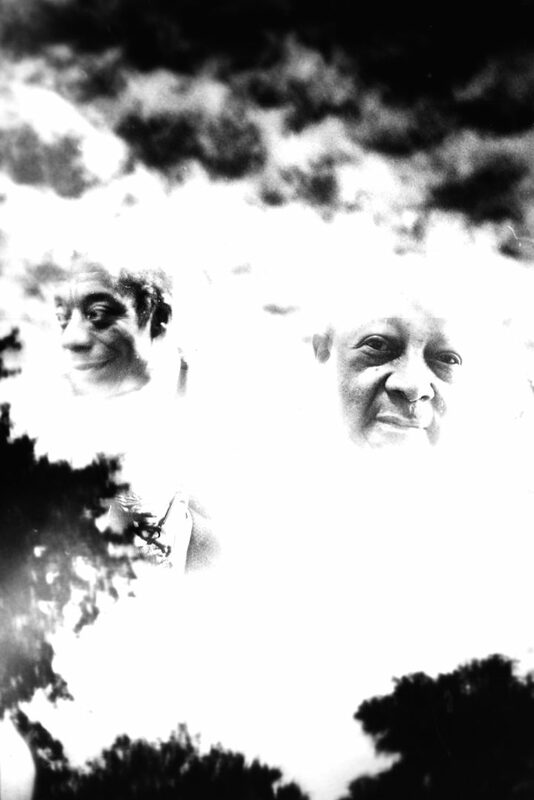 It’s hard to think of another photographer who could set a misty head shot of the writer James Baldwin in a bank of dark clouds over the Harlem skyline and get away with it, but she does, and more than that she creates something heartfelt and gorgeous in its deep feeling and high sophistication. In this series of photographs, Smith honors those who contributed their vision to a community that has largely existed on a separate track from what is commonly called mainstream society. They are seen as guardian spirits. A sense of community, and of individuals who are often isolated within it, is one of Smith’s enduring themes. In the photograph “American Dream” (Harlem, New York, ca. 1972), which is of a large dirty cutout of Santa Claus lying on its side, hoisting a bottle of soda, Smith stirs up a complex of feelings: this is not the white-bearded jolly fatso bringing good cheer. In another photo, “Kites Inside” (Columbus, Ohio, ca. 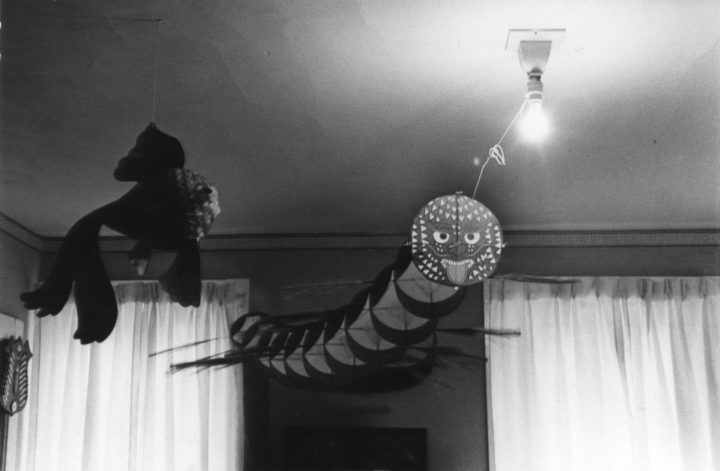 1972), two kites are suspended from the ceiling of an apartment, near a bare bulb. One kite has a round face with its tongue sticking out, while the other is more of a silhouette, and resembles a turkey falling from the sky. The image is comic and disturbing. Is the bare bulb the closest that the kites get to the sun? The rich and varied evocation of passing moments, memories, and dreams that we encounter in Smith’s photographs are things that the incoming President will continue to denigrate and do his best to erase. We cannot let him. Ming Smith continues at the Steven Kasher Gallery (515 West 26th Street, Chelsea, Manhattan) through February 18.